Every month we get more and more orders for acrylic furniture. The idea of acrylic furniture is not a new one as it has been in use since acrylic became commercially available in 1937. However, there are ever expanding uses for the material in furniture and fashion. 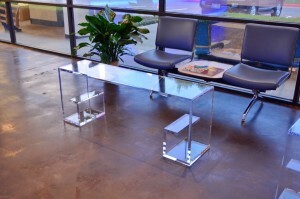 The reason for acrylic furniture’s longevity is its design versatility. The same material can be used in design elements with a nod towards old Hollywood glamor spanning to contemporary pieces. Our ability to cut acrylic with a CNC machine allows us to create highly customized pieces. 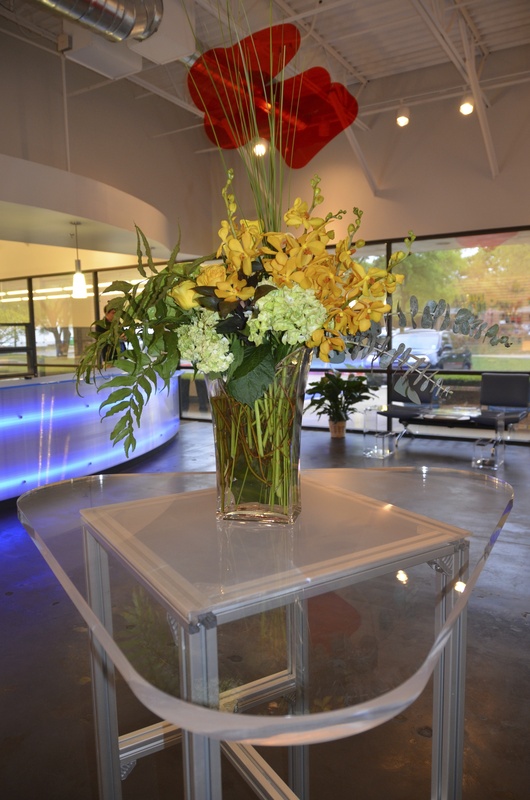 Not to mention, acrylic comes in a variety of colors and thicknesses that allow designers to create custom pieces. However, clear acrylic is usually the most popular. Clear acrylic furniture is a great tool for keeping small spaces feeling open. The transparency does not clutter the space, but designers are still left with a functional piece of furniture. The clear design also complements a wide variety of color schemes and designs, allowing the furniture to grow with consumers ever changing styles and market trends. Both of these tables were fabricated at our Dallas Branch and are found in the showroom. We frequently get orders to fabricate legs for tables and chairs for designers who finish customizing the furniture. A new trend that we are seeing is customers ordering acrylic rod for hand rails, curtain rods, and cabinet hardware. It is an elegant way to elevate everyday items without detracting from the overall design of the space. 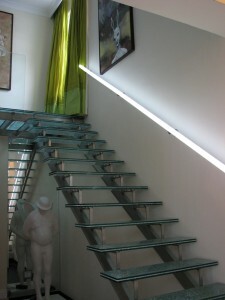 This handrail shows a cool feature with the added LED lights. It creates a unique contemporary feel and can enhance a minimalist space, but most importantly, it eliminates the need to flip on the light for midnight treks up and down the stairs. We love acrylic due to its versatility. It’s a durable material that can used for accent pieces, for a brief touch of acrylic here and there, or a piece of furniture that acts as the focal point of the room. Whether it be simple or ornate, acrylic furniture is here to stay.